Haier reached its current market position, in part, not by fleeing supply chain complexity, as most developing companies are doing, but by embracing it. 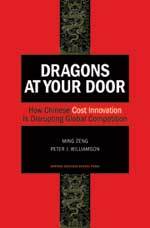 I have been powerfully affected by Dragons at Your Door: How Chinese Cost Innovation is Disrupting Global Competition, a new book by the UK’s Peter Williamson and China’s Ming Zeng. If you are a company in North America, Europe, Japan or actually almost any region, the work should be a wake-up call to better understand and respond to the enormous competitive threat posed by Chinese manufacturers. Whatever is happening now, China will continue to impact our supply chain strategies to an even greater degree for probably decades to come. The central point of the book is that Chinese competition today is much different than “low cost” competition from Japan in the 1960s, then later Korea and other Asian countries. In those cases, the emerging competition was in general more leveragable than threatening to establish companies in developed countries. This new competition was also able to be kept under control, if you will, due to the supply chain limitations faced by the new market entrants at the time. Are not just producing products at low cost, but using the concept of “cost innovation” to attack and eventually dominate entire product segments. Can leverage their huge and rapidly growing domestic market not only to build scale, but to develop products and supply chains that dramatically reduce product and customer usage costs. That’s what it takes to succeed and build a market in China, with brutal competition and still low per capita income. Have emerged in the era of a “Flat World,” in which easily accessible global supply chains flows and dramatically reduced barriers to world trade provide a platform unavailable in earlier periods for the Chinese’s Dragons to build market share world wide. It’s apropos that the first major example cited in the book is China International Marine Containers Group (CIMC), which has moved from a company without a purpose in the early 1990s to one that now enjoys 60% global market share in the ocean container business. Nearby, we provide an excerpt from the book that details the CIMC story, and I highly encourage you to read it. It’s almost scary, actually. In summary, CIMC started at the bottom of the product chain, but found innovative ways to cut costs even from its already low Chinese cost structure. One by one, it moved upstream, knocking off seemingly impervious South Korean, European, and South African rivals in progressively higher end products (e.g., refrigerated and collapsible containers), picking up valuable patents and moving entire production lines to China along the way. It’s the stories like those of CIMC and many others in the book that make it so valuable – it’s the best I have seen in not just describing what Chinese competitors are doing it, but in detailing exactly how those strategies have been and are unfolding. Haier, the Chinese appliance manufacturer, also stands out. For example, it used its cost innovation (manufacturing and design) to fundamentally change the “wine refrigerator” market from one characterized by high prices and specialized distribution, to a mass market product sold at Sam’s Clubs and other retail outlets. It now also has something like 60% market share. It is also a powerful player in most other “white goods” segments. It got there, in part, not by fleeing supply chain complexity, as most developing companies are doing, but by embracing it. Does the supply chain matter here? I’d say so. If fact, the authors persuasively argue that Maytag’s failure to fully understand the competition from the Chinese Dragons (e.g., it could thrive at the high end alone), and a poorly consider partnership with a Chinesecompany for entering the Chinese market itself, were key factors in Maytag’s eventual business troubles, leading to the sale to Whirlpool (only after it outbid an aggressive attempt by Haier to snag the company). Ok, there’s a lot of the bad news if you are competing with China. Other than reaching for the anti-depressant, what can you do? The book’s last chapter offers some suggestions, though I’d say they may be a tad bitter to swallow, in that the path leads through China, rather than strategies that go around it. In fact, Western companies must move beyond thinking about China as a low cost sourcing location or even building some direct manufacturing and design capabilities there, which is often done in an attempt to enter the Chinese domestic market. Companies need strategies from the top to create a “global China mandate,” in effect using China as the basis for your own global cost innovation strategies. There are perils there too, it seems to me, especially around intellectual property. Intel, for example, has been criticize in somequarters for its plans to build a complete chip manufacturing plant in China for the first time, as this may accelerate Chinese knowledge and eventual direct entry into the market. But it just may be the less of two competitive evils. There is so much more in this book, and I encourage both execs and managers to read it. You might send this review or the book excerpt to your CXO’s too. If they don’t see what is happening here, it’s time to get up to speed. What is your take on the “Chinese Dragons” and cost innovation? What strategies can companies in the West and Japan take to compete? What is the role of supply chain?